1. Preheat the oven to 200°C, gas mark 6 and line 2 baking sheets with baking parchment. Heat the butter in a medium pan with 200ml cold water, 1 tbsp sugar and a pinch of salt, until the butter has melted. Bring to a simmer, then remove from the heat and tip in the flour. Beat quickly with a wooden spoon until the flour is incorporated then return to the heat. Cook, stirring constantly, for 3-4 minutes until it forms a smooth ball and pulls away cleanly from the sides of the pan. Transfer to a bowl and leave to cool slightly. 2. Tip the dough into an electric mixer and beat in the eggs until smooth and shiny. Transfer to a piping bag fitted with a 1cm plain nozzle. Pipe 40 small balls of the mixture onto the lined trays and smooth the top of each with a wet finger. Bake for 15 minutes then turn the oven down to 160°C, gas mark 3 and cook for a further 20 minutes until golden brown and crisp. Transfer to a wire rack to cool. 3. Meanwhile, make the filling. Heat the 100g sugar in a large, heavy-based frying pan until completely melted and golden in colour. Tip in the hazelnuts, stir until evenly coated then pour onto a baking sheet lined with baking parchment and leave to cool. Once the caramel has cooled, break into pieces with a rolling pin and set aside 2 tbsp of the mixture for later. Put the remaining caramel into a food processor and blitz to a ground praline — this should take around 3-4 minutes. Beat the ground praline and mascarpone together until smooth, then whip the cream before folding into the mascarpone mix with the orange zest. Chill. 4. For the chocolate sauce, whisk the cocoa powder, golden syrup and a pinch of salt together with 250ml cold water in a small pan until smooth then bring to the boil. Reduce the heat to a simmer and cook for 3 minutes, whisking constantly, until smooth and glossy. Remove from the heat and whisk in the chocolate and butter until smooth. 5. 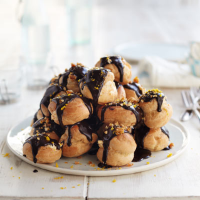 Transfer the filling to a piping bag fitted with a small round nozzle and, making a small opening in each profiterole, fill with the cream mixture. Top with the warm chocolate sauce, sprinkle with the reserved praline and serve. This recipe was first published in Tue Mar 04 14:17:00 GMT 2014.